Join us Saturday, April 6 at Elbow Lake from 10am until noon to learn about birds that could visit your feeder this winter and make a cedar bird feeder to take home. You must register to attend this event. There is a $30 fee associated with building the bird feeder. You can choose between two styles. Hopper Style Feeder: Includes walls and a roof to protect the seeds from the weather. This means you don't have to fill the feeder as often. This size feeder will attract most smaller birds while preventing larger species, like grackles, from monopolizing the feeder. Table Style Feeder: A protected area where seeds can be spread and kept dry. Doesn't hold alot of seed so they need to be filled more often. Platform will drain to prevent water accumulation. These attract most species of birds, including ground feeding birds like juncos. Do you have a child aged 9-14? Are they looking for something to do during March Break? Have them join us at Elbow Lake! Whether it's for one day or two, come to Elbow Lake for our NEW March Break Days! Youth will take part in outdoor games, hikes, science activities, bird house building, and more! Weather depending, we may also have snow shoeing and ice fishing available. Activites will be facilitated by trained Ontario Teachers. The cost is $50 per day (plus registration fee). Cost includes two-way bus transportation from Queen's campus. Pick-up is at 9:00am and drop-off is at 4:30pm. Spaces are limited so don't delay! Join us for an afternoon of ice fishing, 1pm-4pm. Learn from fish biologists about what lurks beneath the ice and tips and tricks for success. Bring your own equipment or borrow one of our rods. When you’re done fishing, warm up by the fire with a hot cocoa. The rods and ice auger at Elbow Lake were funded by the Community Foundation of Kingston & Area. Fishing licences are not needed as it is Licence-Free Ontario from February 16-18th, 2018. Come join us, Saturday, January 5th from 10am until 1pm for our Family Christmas Bird Count at Elbow Lake Environmental Education Centre. Learn about winter birds, join a guided hike, or go out on your own. Enjoy hot cocoa and treats as we tally what we found and see if you can help us top last year's record. All sightings will be reported to Bird Studies Canada as part of the CBC4Kids. All ages are welcome! Bring your binoculars and snowshoes or borrow a pair of ours. For more information, contact Emily Verhoek. Join us Saturday, December 8 at Elbow Lake from 10am until noon to learn about birds that could visit your feeder this winter and make a cedar bird feeder to take home (or give as a gift!). You must register to attend this event. There is a $30 fee associated with building the bird feeder. You can choose between two styles. Ever wondered what that noise is at night? Join us for an exciting night hike to learn about and hear/see the amazing critters that are lively at night! Begins at 7:30; Approximately 1-2 hours. Meet at 7:30 pm in the Pavilion for this free event, or book your family/group into a cabin (special rate $65/cabin) and stay overnight. Drop-ins are welcome, but overnight guests must book accommodation in advance. This event will run rain or "shine". Join us and special guest Tom Ray for a celebration of the Perseids meteor shower! Come for the evening or stay overnight to learn about constellations, planets, the Milky Way, and more! Weather-permitting, a brief indoor presentations will be followed by a guided tour of the night sky using telescope and laser pointer. And how many meteors will you count? If we're lucky and the sky is clear, our stargazing will treat us to a dynamic display! Meet at 7:30 pm in the Pavilion for this free event, or book your family/group into a cabin (special rate $65/cabin) and stay overnight. Drop-ins are welcome, but overnight guests must book accommodation in advance. This event will run rain or "shine"... let's hope for the latter! Bring your binoculars. Ever wondered how things living in water can be hurt by humans? Join us in learning what makes water healthy or unhealthy for the things living in it and find out what you can do to help! Begins at 7:30; Approximately 1-2 hours. Hercules, Draco, Leo, Aquarius … sound familiar? Learn about the origin of these incredible constellations and learn how to find them in the sky! Begins at 7:30; Approximately 1-2 hours. Learn all about common reptile species at Elbow Lake! Join us for a night with special guest Matt Macpherson and identify some of the amazing reptiles that you might even see in your backyard. Begins at 7:30; Approximately 1-2 hours. Join us at the Queen's University Biological Station for the world premiere screening of the film series, "Trees, Youth, Our Future". This two-part documentary series, tells the enduring story of forest stewardship in Ontario. Part 1- The Road to Sustainability: This part traces our relationship with forests from exploitation to stewardship, culminating in the Crown Forest Sustainability Act of 1994. Part 2- New Forests, New Stewards: The Road Forward: This part examines current sustainable forest management on crown and private lands, and in urban forests. It highlights som of the challenges faced by Ontario's forests, as well as the exciting opportunities for youth to get involved. Brought to you by the Eastern Ontario Model Forest and Pinegrove Productions. Saturday, July 14th at 7pm. Includes a meet and greet the producer and refreshments. Click here to RSVP. Contact Emily Verhoek for more information. emily.verhoek@queensu.ca 613-464-9559. Have you ever wondered what creatures are flying around in the night? Join us for an evening of discovering the amazing lives of moths and bats and how they interact. Begins at 7:30; Approximately 1-2 hours. Want to learn how to fish? Join us for a day of family fishing fun. Spend time on the dock, learning from fish biologists about fishing techniques and the importance of catch and release. Don't have a rod... no problem! Use one of ours. Fun for the whole family. There are many prizes to be won. At ELEEC, we only allow catch and release fishing using barbless hooks and no live bait. Come to Elbow Lake Environmental Education Centre on Sunday, July 8th from 9am-3pm to take part. Make a day of it and purchase something from our barbeque. Want to stay the weekend? Book your family/group into a cabin (special rate $65/cabin) and stay the night before. Drop-ins are welcome, but overnight guests must book accommodation in advance, as space is limited. Contact us about renting one of our cabins. Come to the Queen's University Biological Station with your Mom and learn how to create a beautiful pollinator garden. While you plant in our pollinator garden, learn about what plants can attract butterflies, bees, and hummingbirds to your garden at home. Learn about seed saving and growing plants that are adapted for our climate. Make a bee house that you can take home. A fee of $25 applies to make and take home a bee house. Registration encouraged. The event will take place at the Queen's University Biological Station, located at 280 Queen's University Road, Elgin. Join us for some Earth Day Activities at Elbow Lake Environmental Education Centre. Learn about our natural world and how to reduce our impact on it. 1:30 How old is that tree? 3:00 How old is that tree? We suggest you wear rubber boots. A bonfire and dinner will wrap up the day. Hot dogs and marshmallows will be available to cook on the fire. Use of the kitchen is also available if visitors want to bring their own food for dinner. Please contact Emily Verhoek if you have any questions, emily.verhoek@queensu.ca. With the arrival of our feathered friends returning from their winter homes, join us to learn about some of our summer residents. Find out more about the species that call the Frontenac Arch home. Build a bird box to put up in your own backyard. From 1pm-4pm at Elbow Lake Environmental Education Centre. Cost includes all materials to make the box. Do you have a child aged 10-14? Are they looking for something to do during March Break? Have them join us at Elbow Lake! Whether it's for one day or all five, come to Elbow Lake for our NEW March Break Camp! Youth will take part in outdoor games, hikes, science activities, bird house building, and more! The cost is $50 per day or $230 for the week. Cost includes bus transportation from Queen's campus. Pick-up is at 9:00am and drop-off is at 4:30pm. Spaces are limited so don't delay! Fishing licences are not needed as it is Licence-Free Ontario from February 17-19th, 2018. Join us at the Queen's University Biological Station for a Christmas Bird Count for Kids event. Learn about winter birds, join a guided hike, or go out on your own. Enjoy hot cocoa and treats as we tally what we found. All ages are welcome! Learn what YOU can do to help wildlife where you live. Find out about invasive species removal, creating pollinator gardens, and native plants. Learn how to build a gray ratsnake box, bird house, and build a bee box that you take home. Hercules, Draco, Leo, Aquarius … sound familiar? Learn about the origin of these incredible constellations and learn how to find them in the sky! What's that noise? Who's out there? So much of Elbow Lake's biodiversity comes alive at night: Coyotes howl, beavers slap their tails against the water, owls hoot, frogs call, moths flock to porch lights, and loons yodel to each other across the lake. This interactive, hands-on and family-friendly program will introduce visitors to Ontario's most recognizable nocturnal animals, beginning with an indoor presentation and then heading outside in search of the source of all those night-time sounds. Meet at 8 pm in the Pavilion for this free event, or book your family/group into a cabin (special rate $65/cabin) and stay overnight. Drop-ins are welcome, but overnight guests must book accommodation in advance, as space is limited. Rain or shine! Bring a flashlight or headlamp and dress appropriately for a 30-minute night hike. Programming will wrap up around 9:30 pm. Liked the Batman movies? Well, join us for a real-life Batman movie! Through an evening hike, you will learn about common bats and moths, as well as predator-prey interactions (just like Batman catching his criminals)! The South Delta Aquarid meteor shower peaks this weekend. Come for the evening or stay overnight to learn about constellations, planets, the Milky Way, satellites and more! Weather-permitting, a brief indoor presentations will be followed by story-telling around a bonfire as we discover the legends behind the constellations, accompanied by a guided tour of the night sky using telescope and laser pointer. And how many meteors will you count? If we're lucky and the sky is clear, our stargazing will treat us to a dynamic display! Not everyone sleeps at night time. There are many birds that are lively at night! Join us for an evening hike and/or canoe to learn about some birds we might hear or see at night. Begins at 7:30; Approximately 1-2 hours. Learn all about common frog species at Elbow Lake! Join us for a night hike to hear and identify some of the amazing frog calls that you might even hear in your backyard. Begins at 7:30; Approximately 1-2 hours. Come to Elbow Lake Environmental Education Centre on Saturday July 8th from 9am-3pm to take part. Make a day of it and purchase something from our barbeque. Want to stay the weekend? Book your family/group into a cabin (special rate $65/cabin) and stay overnight. Drop-ins are welcome, but overnight guests must book accommodation in advance, as space is limited. Contact us about renting one of our cabins. In celebration of Earth Day 2017, volunteers and students from Queen's University Let's Talk Science Outreach welcome you to a Let's Talk Field Biology Open House! Free events will include hands-on activites focusing on various aspects of the natural world and interactive indoor displays throughout the afternoon, while the evening will share field stories around the campfire and a hike to listen for owls. Visit the event website for more information and the day's agenda. Drop in anytime 2 pm to 8:30 pm for this free event rated "E" for Everyone! Individuals, families, and groups of all ages and abilities will be inspired by the nature around use. Rain or shine. Bring binoculars if you have them! A limited number of cabins are available for families and groups interested in staying overnight ($85/cabin) and enjoying a relaxing Sunday spring morning on the Elbow Lake property. Overnight guests must book accommodation in advance. Our society is increasingly reliant on information technology (IT) in our everyday lives. The four-part Nature: Explore IT! workshop series will familiarize you with the technology and capabilities of mobile devices (phones and tablets), using examples that build on an overarching theme of exploring nature using IT. While each workshop builds on the knowledge gained in Part 1 - Getting Started, later offerings in this series are designed to stand alone, particularly for participants with a basic familiarity with mobile device technology. What is an app? Where are the best places to get them, and how to know which are top-quality? Common nature apps for Citizen Science, including eBird, EDDMaps, and the Ontario Reptile and Amphibian Atlas. ... other topics to be determined based on participants' interests. Two two-hour session options are offered for Part 4 - Using Apps for Citizen Science: April 2 (Sunday) from 1-3 pm*, or April 4 (Tuesday) from 1-3 pm*. Advance registration required. Fee is $15/person. This workshop includes a short hike to gather and document natural history information, so dress appropriately for 20 minutes outdoors. *A 30-minute refresher on the basics, as per Part 1: Getting Started, will be offered prior to each session. $5/person. The bird activity and diversity at the Pavilion feeders never fails to captivate our guests' attention. Individuals from eight different species visit reliably, many more come regularly to feed. Our Winter Feeder Birds workshop is the perfect opportunity for you to learn more about our feathered neighbours. Can you tell the difference between a Downy Woodpecker and a Hairy Woodpecker? Where do the bright yellow "canaries" go in the winter? How do our resident birds use different niches within the same general habitat, so as to avoid competition with each other? The Winter Feeder Birds workshop has the answers to all of this -- and more! The indoor presentation incorporates a mix of live and preserved bird specimens, drawn and photographic images, and audio files to teach you to identify over a dozen common winter birds of the local area. For those interested in getting involved in Citizen Science research, we can share tips and ideas for monitoring bird populations both at home and in the community. The workshop ends with a short outdoor excursion to investigate bird-friendly features of the surrounding habitat. Booking is by appointment, as this 1-1.5 hr daytime presentation is customized to the age, specific interests, and abilities of the group. Families welcome! Ideal group size is 8-10 people. Information security and tips to protect yourself from privacy invasion! Two two-hour session options are offered for Part 3 - The Internet of Things: March 26 (Sunday) from 1-3 pm*, or March 28 (Tuesday) from 1-3 pm*. Advance registration required. Fee is $15/person. Experience the peaceful tranquility of the Frontenac Arch landscape on a winter's day or evening. Round up friends, family, classmates, and/or co-workers for a 1-1.5 hr guided snowshoe tour of the Elbow Lake property. Explore wetlands and forests while watching and listening for wildlife. Guaranteed fresh air and exercise! Warm up afterward with tea and hot chocolate. Booking is by appointment, as each tour will be customized to the needs, specific interests, and abilities of the individual or group. Fees apply ($30/hr). A very limited number of snowshoes may be available to rent ($5 each) with sufficient advance notice, so please bring your own. Queen's university students, faculty, and staff may rent equipment via membership in the Queen's University Outdoors Club. Don't forget to bring a headlamp for nocturnal excursions! Tips to lessen data usage and thus avoid "overage" charges! Three two-hour session options are offered for Part 2 - Photos, Videos, Music & Social Media: February 19 (Sunday) from 1-3 pm*, or February 21 (Tuesday) from 1-3 pm* or from 7-9 pm*. Advance registration required. Fee is $15/person. We will be photographing nature during this workshop, so dress appropriately for 20 minutes outdoors! Have you ever wanted to try ice fishing? The Yellow Perch and Black Crappie in Elbow Lake are the local anglers' best-kept winter secret, and now Ontario Women Anglers is going to share those secrets with you! Learn ice fishing techniques, understand the equipment that supports winter angling, and enjoy a panfish dinner in the cameraderie of like-minded winter-loving women. See the event flyer for registration details. But hurry --These events always sell out FAST! Tips to avoid having bad things happen to your computer! Three two-hour session options are offered for Part 1 - Getting Started: January 22 (Sunday) from 1-3 pm, or January 24 (Tuesday) from 1-3 pm or from 7-9 pm. Bring your personal mobile device and any questions you may have. Participants who don't yet own a phone or tablet may borrow an iPad for use during this workshop. Advance registration required, as each workshop will be capped at 12 participants. Fee is $15/person. Refer to the specific event notice for details on upcoming workshops in the Nature: Explore IT! series. Looking for outdoor, nature-based activities to engage and educate youth? Visit our booth at the Youth Programs and Camps Expo to learn more about what ELEEC and Eco-Adventure Camp programs have to offer. All ages are welcome at this family-friendly showcase! Mark your calendar and plan to stop by: 10 am to 2 pm at Grant Hall - 43 University Ave., Queen's University. All women are invited to the 3rd Annual Wise Woman Retreat! Recharge, connect with nature, and connect with other women in a non-judgemental circle. Whether you receive wisdom or share it, participate in a myriad of activities or simply seek solitude and relaxation at Elbow Lake, this annual weekend retreat is your chance to press "pause" on your busy life! Visit Wise Woman Retreat on Facebook for additional details and registration. Hurry - this popular event sells out quickly! We invite all outdoor and nature enthusiasts to celebrate Christmas by observing and counting birds in the 45,000 ha "Frontenac" Christmas Bird Count (CBC) circle. No experience or birding skills necessary to take part in the largest Citizen Science project worldwide! This circle has a vast acreage of protected areas to cover - Frontenac Provincial Park and the Elbow Lake property included - so we are as much in need of "pedestrian" surveyors (hike, cycle, snowshoe or ski, as weather permits) as we are of drivers. Join us as a birder, navigator, scribe or simply for good company! Contact the Frontenac CBC Coordinators if you are interested in participating as a field surveyor, or willing to count the birds that visit your feeder at home. Field teams will meet at 8:30 am at the Sydenham Branch of the Kingston Frontenac Public Library, where a "Winter Birds 101" crash-course will familiarize new birders with some of the species they may encounter, carpooling will be arranged, and teams will disperse. We round up at the library again for 4:30 pm to enjoy a warm meal, tally our counts, and share stories of the day. Read about highlights from last year's survey in the Frontenac CBC 2015 Report and the Frontenac Gazette. Families with young children are invited to participate in the Christmas Bird Count for Kids at Elbow Lake - see the event notice for more information. Families are invited to participate in the Frontenac Christmas Bird Count through the Christmas Bird Count for Kids, which introduces younger nature enthusiasts to birdwatching and winter bird diversity. A hands-on, highly sensory indoor presentation will explore common birds of the Elbow Lake property after which our "birding team" will arm ourselves with binoculars and field guides and head outside on a guided hike to count birds. Suitable for children ages four and up, although novice adult birders and the "young-at-heart" are also welcome! Come to the Pavilion for 9:30 am, dress appropriately for one hour outdoors, and bring a lunch if you wish as we will wrap up around 12 noon with hot chocolate and treats. This event is free, but advance registration is highly recommended. Teens and older youth are encouraged to help survey within the Frontenac CBC circle - see the event notice and contact the Frontenac CBC Coordinators to participate in North America's longest-running Citizen Science project! Join the Elbow Lake volunteer crew as we work to eradicate invasive European Buckthorn and Common Lilac from a neighboring property, and then return to the Elbow Lake property to remove more buckthorn. Rain or shine, meet at the Maintenance Building, #1300 Hewlett-Packard Ln. for a 10 am start. All ages welcome. Dress appropriately for the outdoors (including possible encounters with Poison Ivy), and bring work gloves if you have them. Our day will wrap up around 3 pm. Please register via the ELEEC at 613-353-7968. Those participants only able to commit a half day are still encouraged to assist for a morning or the afternoon. Fall into your creative self at this retreat for all women who love to be creative, want to be inspired, return to nature, play, let go and have time for themselves. All art experience levels are welcome - the focus is play and experimentation through making. Explore encaustic and beeswax painting with Julie Davidson Smith, a homemade lunch, and meditation and mandalas with artist and educator Shannon Brown. Day concludes with gentle, restorative yoga with instructor Janna Stanistreet. Cost is $180/person. For more information, call 613-583-8901 or visit Creative Life Kingston. Join NCC staff and the Elbow Lake volunteer crew as we work to eradicate invasive European Buckthorn from the south end of the property. Rain or shine, meet at the Maintenance Building, #1300 Hewlett-Packard Ln. for a 10 am start. NCC properties are subdivided into grids, and our goal for the day will be to work a transect across one or two grids at the south end of the property (near North Shore Road) where Buckthorn is abundant. All ages welcome, as everyone will have a task: Trained staff and volunteers will operate chainsaws, and hand tools such as pruning saws, lopers, and Extractigators will be available for others. Note that NCC staff will be applying herbicide to the cut ends of larger shrubs. Dress appropriately for the outdoors (including possible encounters with Poison Ivy), and bring work gloves and hand tools if you have them. Our day will wrap up around 3 pm. In response to incredible demand (the July 19-21 session sold out in only two hours! ), Otario Women Anglers repeats this highly successful workshop sure to build your skill, knowledge and enjoyment of bass fishing. See the event flyer for details and registration. But, register early - space is limited and even this additional session is booking quickly! What's that noise? Who's out there? So much of Elbow Lake's biodiversity comes alive at night: Coyotes howl, beavers slap their tails against the water, frogs call, moths flock to porch lights, and loons yodel to each other across the lake. This interactive, hands-on and family-friendly program will introduce visitors to Ontario's most recognizable nocturnal animals, beginning with an indoor presentation and then heading outside in search of the source of all those night-time sounds. Meet at 8 pm in the Pavilion for this free event, or book your family/group into a cabin (special rate $60/cabin) and stay overnight. Drop-ins are welcome, but overnight guests must book accommodation in advance, as space is limited. Rain or shine! Bring a flashlight or headlamp and dress appropriately for a 30-minute night hike. Programming will wrap up around 9:30 pm. The Extractigator(R) is a Canadian-made plant pulling tool that is quickly earning a reputation for being “guaranteed the easiest way to remove invasive plants – roots and all!” Successfully used for non-chemical invasive shrub eradication by volunteers with the Royal Botanical Gardens, the Frontenac Stewardship Foundation has been offered the opportunity to demo some Extractigators – and we need your input! Join a demonstration session and try pulling shrubs of up to 2 inches in diameter using the Extractigator. Target species for eradication from the Elbow Lake property include European Buckthorn, Common Lilac and Black Locust. Does the Extractigator easily and effectively remove these shrubs in their entirety? Can people of all ages – form school-age children to older adults – comfortably operate the Extractigator? Demonstrations will be offered at 10 am, 11 am, 1 pm and 2 pm. Meet at the Maintenance Building, #1300 Hewlett Packard Ln. Dress appropriately for the outdoors; work gloves and drinking water recommended. There is no cost to attend a demonstration session. Based on participant feedback, the Frotnenac Stewardship Foundation is considering purchasing some of these tools to loan to landowners and other invasive species managers in the local community. Ontario Women Anglers returns to ELEEC with a repeat of last year's highly successful workshop sure to build your skill, knowledge and enjoyment of bass fishing. See the event flyer for details. THIS WORKSHOP SOLD OUT IN 2 HOURS! A second session is being offered August 19-21. It's easy to overlook the biodiversity that awakens as we humans settle down for the night. Did you know that there are more than 10 times as many species of moth in North America as there are birds? Let yourself be amazed by the incredible diversity of moths on the Elbow Lake property. Learn about their life cycle, favourite foods and creative ways of deterring predators, as well as their role in the ecosystem as pollinators and indicators of environmental health due to impacts of pollution, pesticides or climate change. Meet at 8:30 pm in the Pavilion for this free event, or book your family/group into a cabin (special rate $60/cabin) and stay overnight. Drop-ins are welcome, but overnight guests must book accommodation in advance, as space is limited. This event will run rain or shine, as we will be set up to attract and display moths in several sheltered locations. We will spend the night periodically checking on lights set up around the property and identifying moths we encounter. Bring a flashlight or headlamp, as well as drink/snacks; a camera is optional but recommended. The Eta Aquarid meteor shower peaks this morning and, if we're lucky and the sky is clear, our evening stargazing will treat us to a dynamic display! Come for the evening or stay overnight to learn about constellations, planets, the Milky Way, satellites and more! Weather-permitting, a brief indoor presentation will be followed by story-telling around a bonfire as we discover the legends behind the constellations, accompanied by a guided tour of the night sky using telescope and laser pointer. And how many meteors will you count? Bring your binoculars! Meet at 7:30 pm in the Pavilion for this free event, or book your family/group into a cabin (special rate $60/cabin) and stay overnight. Drop-ins are welcome, but overnight guests must book accommodation in advance. This event will run rain or shine... let's hope for the latter so that we can see the double shadow on Jupiter from two of its four moons! The bird activity and diversity at the Pavilion feeders never fails to captivate our visitors' attention. Individuals from eight different species visit reliably, and several more species are occasional visitors or can be found on the property in winter. Our Winter Feeder Birds workshop is the perfect opportunity for you to learn more about our feathered neighbours. What specific niche do these different species occupy, so as to avoid competition with each other within the same general habitat? Do you know the difference between a Downy Woodpecker and a Hairy Woodpecker? Where do our bright yellow "canaries" go in the winter? The Winter Feeder Birds workshop has the answers to all of this -- and more! The indoor presentation incorporates a mix of live and preserved bird specimens, drawn and photographic images, and audio files to teach you how to identify over a dozen common winter birds of the local area. For those interested in getting involved in Citizen Science research, we can share tips and ideas for monitoring bird populations both at home and in the community. The workshop ends with a short outdoor excursion to investigate bird-friendly featurs of the surrounding habitat. Booking is by appointment, as this 1-1.5 hour daytime presentation is customized to the age, interest and abilities of the group. Families welcome! Fees apply ($30); recommended maximum group size is 15 participants. Binoculars are available to borrow. Come experience the peaceful tranquility of the Frontenac Arch landscpae on a winter's day or evening. Round up friends, family, classmates, and/or co-workers for a 1.5 hr guided snowshoe tour of the Elbow Lake property, to explore wetlands and forests while watching and listening for wildlife. Guaranteed fresh air and exercise! Warm up afterward with tea and hot chocolate. Booking is by appointment, as each tour will be customized to the needs, interest and abilities of the group. Fees apply ($30/hr). A very limited number of snowshoes may be available to rent ($5 each), so please bring your own. Queen's University students, staff and faculty may rent equipment via membership in the Queen's University Outdoors Club. This one-night, two-day retreat welcomes all women to congregate in a non-judgemental circle and enjoy workshops, yoga, outdoor activity, Saturday night Coffee House, communal meals and massage... or simply seek solitude and relaxation on the shores of Elbow Lake. See the Wise Woman Retreat invitation or visit their Facebook page for details and registration. Concurrent with the Frontenac Christmas Bird Count, Christmas Bird Count for Kids will introduce younger nature enthusiasts and their families to birdwatching and local winter bird diversity. These introductory workshops are suitable for ages six and up, and "young-at-heart" novice birders are also welcome! Then, armed with binoculars, field guides and audio call recordings, "teams" will head out to count birds on designated routes. The morning session will run from 9:30 am to noon, and the afternoon session from 1:00 pm to 3:30 pm. Workshops are free, but advance registration is highly recommended. Please contact Joanna Piernicka, Environmental Outreach Assistant, at outreach.eleec@gmail.com. Extra hands are needed to build two new bridges across beaver dams on the Orange Trail. Tasks include assembling crib supports, collecting crib rocks, and placing and securing the 17-foot-long split cedar logs that will be the decks. Thanks to a volunteer crew this summer, all logs and materials are ready and waiting at the bridge sites! This work will be physical, but definitely rewarding as the two bridges will vastly improve pedestrian access to Spectacle Lake, including an old horse stable and a frog call monitoring station. Round up for 10 am each day at the Maintenance yard, #1300 Hewlett-Packard Lane. Bring work gloves (if you have them), comfortable footwear for hiking the trails, plenty of water and a lunch. Overnight accommodation ($30/cabin) is available for volunteers wishing to incorporate a recreational visit with their families this weekend. Our local ecosystems are increasingly at risk from invasive exotic species that out-compete our native biodiversity, pose public health hazards and bring on economic hardship. Landowners, communities, and informed members of the public can play an important role in mitigating local threats. Provincial leaders and Queen's University representatives will share current policy, research and on-the-ground practices to combat non-native invasive species. Using case studies that emphasize local threats, a hands-on outdoor tour to identify the most common invaders of the Frontenac Arch, and a demonstration of active invasive species management techniques, this seminar will empower you with the knowledge and ability to join the global battle against invading species. Space is limited at this free event, so register early! Overnight accommodation ($60/cabin) is available for seminar participants, but must be booked in advance. The Perseid meteor shower peaks tonight and, if we're lucky and the sky is clear, our stargazing will treat us to a dynamic display! Come for the evening or stay overnight to learn about constellations, planets, the Milky Way, satellites and more! Weather-permitting, a brief indoor presentation will be followed by story-telling around a bonfire as we discover the legends behind the constellations, accompanied by a guided tour of the night sky using telescope and laser pointer. And how many meteors will you count? Bring your binoculars! Meet at 7:30 pm in the Pavilion for this free event, or book your family/group into a cabin (special rate $60/cabin) and stay overnight. Drop-ins are welcome, but overnight guests must book accommodation in advance. This event will run rain or shine... let's hope for the latter! Following last year's successful Fishing 101 for Women weekend, Ontario Women Anglers are returning to ELEEC with this specific workshop sure to build your skill, knowledge and enjoyment of bass fishing. Activities also include canoeing 101, potluck meals, and a fun fishing tournament on Sunday. REGISTRATION FULL - Contact Fishing 101 for Women to be added to the wait list! Have you ever wondered what ecological field work is all about? If you missed our June session, or want to learn more, tonight is the second event in this popular series! What happens in the field stays in the field... until now. Join the hosts of the popular blog "Dispatches in the Field" for an evening of slide show presentations, interactive demonstrations, and short stories from researchers, resource managers and others as they share the trials, tribulations and necessary humour of working in and with nature. As night falls, we will venture into the wilds of the Elbow Lake property in search of our own stories from the field! Meet at 7 pm in the Pavilion for this free event, or book your family/group into a cabin (special rate $60/cabin) and stay overnight for a full "in the field" experience! Drop-ins are welcome, but overnight guests must book accommodation in advance. This event will run rain or shine. Is someone from your family participating in this summer's Eco-Adventure Camp? Ask us about special overnight rate! Reptiles are the most "at risk" class of wildlife in Canada, with the majority classified as Endangered, Threatened or Special Concern nationally and/or provincially. This workshop will introduce adult participants to local reptiles at risk through a slideshow presentation and hands-on identification training using live native specimens. This free workshop runs from 1-4 pm in the Pavilion. Drop-ins are welcome, although advance registration is encouraged. Participants registering in advance have the option to book their family/group into a cabin for Saturday night (special rate $60/cabin) to extend their visit to the ELEEC. The Elbow Lake property is home to many Species at Risk reptiles such as Blanding's Turtle, Gray Ratsnake, and Ontario's only lizard, the Five-lined Skink. Bring the whole family to meet and greet these and other Ontario reptiles at risk, and learn how we can all help protect and preserve these fascinating friends. Meet at 10 am in the Pavilion for this free, hour-long event! Have you ever wondered what ecological field work is all about? Tonight is your chance to find out! What happens in the field stays in the field... until now. Join the hosts of the popular blog "Dispatches in the Field" for an evening of slide show presentations, interactive demonstrations, and short stories around the campfire from researchers, resource managers and others as they share the trials, tribulations and necessary humour of working in and with nature. As night falls, we will venture into the wilds of the Elbow Lake property in search of our own stories from the field! Fees apply: Participate for the evening at our day use fee ($8/adult or $4/youth under 16), or book your family/group into a cabin and stay overnight for a full "in the field" experience! Meet 7 pm in the Pavilion. Drop-ins are welcome, but overnight guests must book accommodation in advance. Are you a student, and involved in your school's environmental group or Eco-Team? Ask your teacher about ELEEC's special rate for you and your family to participate in this event! Local artists Julie Davidson Smith and Tracy Olan have teamed up to offer a fabulous retreat for women who crave time for their creativity, who long to be in nature and have the time to just be. Participate in small-group workshops on felting (wool art) with Tracy and encaustic (wax) painting with Julie. This weekend is for you: A time to go at your own speed, make art furiously, retreat to your cabin to nap, or take a walk in the woods. Come and sink into yourself! Fees are $325/person, and include all meals, cabin accommodation, two-day indoor workshops, inspiration, materials, yoga and time with passionate artists. See the attached flyer for agenda and registration details. Meet and greet QUBS and ELEEC staff, Eco-Adventure Camp counsellors, and our dedicated volunteers. Enjoy a guided hike on the trails to check out the new educational panels and try out the new Interpretive Trails app! Paddle Elbow Lake and learn about its ecology with Nature Conservancy of Canada staff. Register for summer Eco-Adventure Camp. Experience our educational programming for students. Take a guided tour of the ELEEC facility. Sign up to attend one of our upcoming public outreach events. Celebrate the Grand Opening of a new bridge on the Red Trail! Come visit the Queen's University Biological Station booth at Science Rendezvous, a public celebration of science and technology. This is a unique opportunity for learners of all ages to engage with physics, chemistry, geology, biology, astronomy and engineering. Check out this FREE event from 10 am to 3 pm at the Roger's K-Rock Centre in downtown Kingston. Thanks to a late spring, many seasonal tasks need to be done in a short timeframe. All hands on deck! This year's work bee will tackle a number of tasks: Transporting materials across the lake to two new bridge sites; constructing ramps for the new bridge on the Red Trail, cleaning PFD's and arranging equiment in the new aquatics shed, and spring cleaning two cabins in need of a little extra TLC. Everyone is welcome — this event is intended as a social gathering as much as a work bee. Interested in participating in the Owl Program the evening before, and then staying overnight? Volunteers in the work bee can earn complimentary accommodation -- ask us how! RSVP if you are able to participate so that cleaning equipment and supplies can be organized in advance, and overnight accommodation can be reserved, if desired. Drop-ins welcome! Bring the family for a night out at the ELEEC! Our evening program will introduce a group of birds that many find mysterious and intriguing: The stealthy, secretive nocturnal owls. Hear about their fascinating adaptations to hunting in the dark, and learn to identify our local owls by sight and by their calls. This family-friendly presentation will offer lots of hands-on activity, and -- weather permitting -- will be followed by a night-time "owl prowl" to try and observe these fascinating birds in the wilds of the Elbow Lake property. Fees apply: Participate for the evening at our day use fee ($8/adult or $4/youth under 16), or book your family/group into a cabin (special rate $60/cabin) and stay overnight. Meet 6:45 pm in the Pavilion. Drop-ins are welcome, but overnight guests must book accommodation in advance. OUR VOLUNTEER WORK BEE IS SATURDAY, MAY 2! Participants in the Owl Program can volunteer the next day to earn complimentary accommodation -- ask us how! Snowshoe (or hike, depending on conditions) 8 km of moderately-rugged trail and/or backcountry at the Elbow Lake Environmental Education Centre. Learn about the effects of past human impacts on the landscape, current management actions, and fascinating research taking place on the property as we strive to better understand our local environment. Warm up with lunch and tea at the Pavilion. Day Use fees apply ($8/person). Come experience the peaceful tranquility of the Frontenac Arch landscape on a winter's evening. Round up friends and family for a snowshoe tour of the Elbow Lake property, to explore wetlands and forests while listening for Great-Horned Owls and Coyotes. Guaranteed are fresh air and exercise! Warm up afterward with tea and hot chocolate. Minimum 8 people/group; booking is by appointment, as each tour will be customized to the needs and abilities of the group. Fees apply ($8/adult or $4/children under 12). Snowshoes NOT provided; please bring your own. This one-night, two-day retreat welcomes adult women of all ages to congregate in a non-judgemental circle. Connect with others in your community, participate in workshops that expand your skills, be active outdoors, enjoy a massage (or two! ), enjoy healthy meals... or simply relax in a peaceful setting and catch up on sleep. See the program package for details and registration, or check out the Wise Woman Retreat page on Facebook. Building on the success of previous years, the dynamic and hands-on Eco-Adventure Camp immerses young people between 10 and 14 years old in nature and outdoor activities throughout the summer. A four-day Leader-in-Training Program for young adults, aged 15 to 18 years, teaches participants more advanced outdoor and camp leadership skills. Thursday nights are "Family Nights"! Same event as presented on July 17, but this month — if we're lucky and the sky is clear — our stargazing will catch the tail end of the annual Perseid meteor shower! On a clear, moonless night away from urban areas, the sky offers an amazing array of astronomical delights. Come for the evening or stay overnight to learn about constellations, planets, star clusters, nebulas, the Milky Way, other galaxies, satellites and the international space station. Understanding space and time is a healthy mind altering experience; wrapping our head around some of the realities of our universe is entertaining. An energetic indoor presentation will be followed by a guided tour of the night sky using telescope and laser pointer. Bring your binoculars! Fees apply: Special rate of $60/cabin for overnight visitors! Participate for the evening presentation at our day use fee ($8/adult or $4/youth under 16). Meet at 8 pm in the Pavilion. Drop-ins are welcome, but overnight guests must book a cabin in advance. New this year, the popular Fishing 101 for Women has expended into a full weekend of fishing fun! Female anglers will enjoy learning the basics of fishing from seasoned pros in a spectacular natural setting. See the event flyer for details and registration. There is no better way to celebrate spring than with a visit to the Elbow Lake property! Everyone is welcome when we open the doors of the Elbow Lake Environmental Education Centre to friends, neighbours, day campers, families, educators, conservation partners and Queen's alumni. Meet and greet QUBS, ELEEC and Eco-Adventure Camp staff and volunteers. Explore the trails or paddle Elbow Lake with a knowledgeable guide. Learn about our educational programming. Celebrate with us as we unveil our new logo! The focus of this season’s work bee is Spring Cleaning the Cabins, so round up your family, friends and favourite vacuum cleaner (because don’t we all have a favourite vacuum cleaner?) and join the housekeeping action! Everyone is welcome — this event is intended as a social gathering as much as a work bee. Interested in staying overnight? Earn a complimentary overnight stay for your team by thoroughly cleaning a cabin (typically a 3-hour job for two adults) and let your hard work pay off in a relaxing Sunday at ELEEC. RSVP if you are able to participate so that cleaning equipment and supplies can be organized in advance, and overnight accommodation can be reserved, if desired. Drop-ins welcome! Hike 8 km of moderately-rugged trail at the Elbow Lake Environmental Education Centre, a new satellite facility of the Queen's University Biological Station. 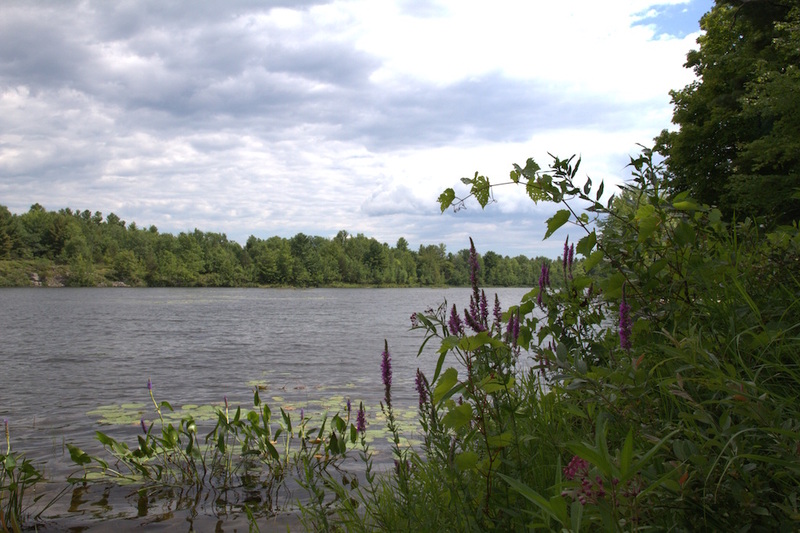 Learn the history of the ecologically significant Frontenac Arch Natural Area and the Centre's goal of bringing biodiversity and conservation education to the community. Warm up afterward with lunch and tea at the Pavilion. Day Use fees apply ($8/person). Come experience the peaceful tranquility of the Frontenac Arch landscape on a winter's evening. Round up friends and family to join ELEEC staff on a snowshoe tour of the Elbow Lake property, as we explore wetlands and forests while listening for Great-Horned Owls and Coyotes. Guaranteed are fresh air and exercise! Warm up afterward with tea and hot chocolate. Minimum 8 people/group; booking is by appointment, as each tour will be customized to the needs and abilities of the group. Fees apply ($8/adult or $4/children under 12). Eco-Adventure Camp on-line registration is now open for our 2019 camp.